Objectives: It has been suggested that increased exposure to galactose, due to high consumption of dairy foods or reduced galactose metabolism, is associated with the development of ovarian cancer. We have investigated this in a large case-control study conducted in three Australian states between 1990 and 1993. Methods: Approximately 800 histologically-confirmed cases, 800 community controls and 300 controls recruited␣ through breast-screening clinics completed dietary questionnaires. Approximately 100 cases and all breast-screening controls also provided a blood sample for analysis of galactose-1-phosphate- uridyltransferase (GALT). 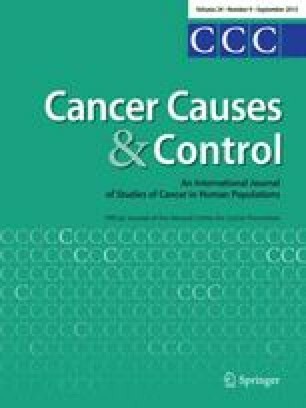 Results: Ovarian cancer risk was positively associated with increasing consumption of whole milk and other full-fat dairy foods, but was not associated with consumption of low-fat dairy foods and was inversely related to consumption of skimmed milk. There was no association between ovarian cancer and GALT except among women with abnormally low GALT who had a non-significant 2.5-fold increased risk of ovarian cancer. Conclusions: These data do not support the hypothesis that galactose plays a major role in the development of ovarian cancer and suggest that reported associations between milk consumption and ovarian cancer are due to the fat content of milk and not to lactose or galactose. An increased risk of ovarian cancer in women with abnormally low levels of GALT cannot, however, be ruled out.